Good news and bad news for Facebook. 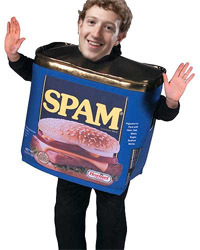 Last week they won a legal battle against a spammer and the court ordered the loser to pay Facebook $873 million in damages. Bad news is, that fee is impossible for a small time spammer to pay. In retrospect, Facebook sued Adam Guerbuez and Atlantis Blue for sending sleazy messages to Facebook users. Unfortunately, Facebook too knows that collecting $873 million from Guerbuez and Atlantis Blue is next to impossible. They will try to, but they’ll probably give up or tire down. They do take a consolation out of this. Facebook will be using this as an example and warning to spammers who try to spread junk and useless content on their platform. On the brighter side, online companies fighting battles against spammers of all kinds will be able to use this example as a deterrent. I’m sure that those companies planning to sue some spammer just got a morale boost anf will probably be filing the suit tomorrow.